film algae on glass ,,again..
Thread: film algae on glass ,,again..
this algae that grows on my glass is driving me nuts :! : It will cover the viewing panes in 24 hours. I have no other algae in the system(except for the scrubber screen of course!) any tips? Re: film algae on glass ,,again..
How long has the scrubber been running? What color is that algae? are you sure it is not Cyanobacteria? You have high nutrients in your water, due to a weak scrubber, relative to the amount of feeding you are doing. A scrubber that is strong, relative to the amount of feeding, will keep the glass-cleaning away for up to 2 weeks. Or there is too much C in the system. If you mean Carbon, then this would not be true. Algae consume Inorganic Nitrate and Inorganic Phosphate, not organic Carbon (which is just food). Yes but he was talking about algae on the glass. yes it is green film algae on the glass. some days it will cover the viewing panes in 12 hours and other times it takes 48 hours. 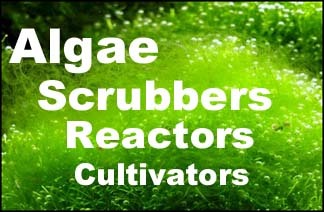 I have noticed that my scrubber screen is growing some maroon colored algae lately. my bulbs are only 2 months old at worst. recomended action? I suspect he would not know the difference. Most tanks, normally with or without algae in the display, have a 4-7 days glass buildup with ~20 ppm nitrate and >0 phosphate. Do you have any cyano on the sand?